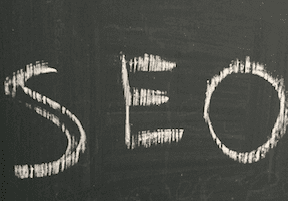 SEO How-to, Part 1: Why Do You Need It? Editor’s note: This post begins a weekly primer in SEO, with the goal of touching on all of the foundational aspects. At the end, you’ll be able to practice SEO more confidently and converse with others regarding important SEO challenges and opportunities. Google alone controls access to trillions of annual requests for information. Google, Yahoo, and Bing remain three of the U.S.’s top four trafficked websites, according to comScore, the research firm. Presence in search results is critical to generating brand awareness and preference. With an estimated $80 billion spent online in the 2016 holiday season alone, and the increasingly “micro-moment,” quick-search mentality of mobile consumers, SEO is more important than ever to driving shoppers to your site and away from the competition. SEO is simply the practice of optimizing your search-engine presence to produce traffic and to your site. It is also called organic search or natural search. SEO should thread through every aspect of an organization — from product planning, traditional marketing, and customer support to the more obvious areas of digital planning, strategy, content, user experience, design, development, and deployment. Search engines do not charge advertising fees for natural search results. Visually, natural search results are always toward the top of the page at the left side. Depending on the search engine and the query, there will probably be ads above the natural listings, as shown below. With all of the other boxes and components on the search results page, it is increasingly difficult to claim a visible spot in the first view. 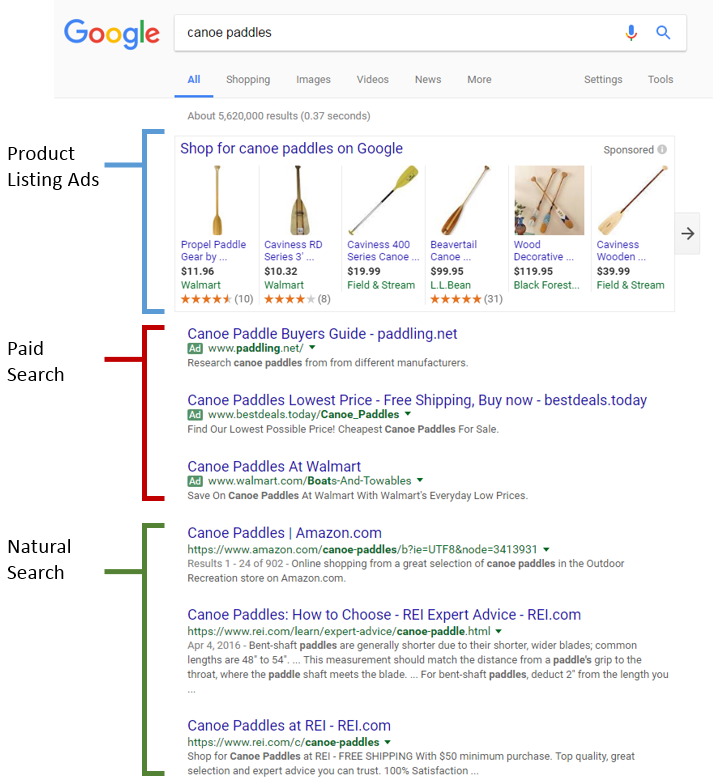 Google frequently places a Product Listing Ads box and up to four other ads above the first natural search listing, resulting in only one or two visible natural search listings when the page loads. Regardless, natural search remains one of the top-performing digital marketing channels for most ecommerce businesses. 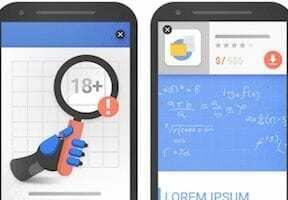 Some studies put the average traffic driven by natural search at around 50 percent of the total, and average revenue driven at about 40 percent. But in my experience, it varies widely based on the size of the business, and the maturity and spend of their marketing mix. The more balanced the marketing spend is for the various channels — such as social, email, video, display ads — the lower natural search performance will be as a percentage of the whole, especially as the other channels mature and perform. I’ve seen businesses that drove 75 percent of their traffic and sales via natural search. This level of dependence on SEO is dangerous because a single algorithm update or SEO-impacting technical glitch could decimate your revenue stream. However, even a business with a mature marketing mix and a site truly search-engine optimized should drive 15 to 25 percent of its traffic and revenue via natural search. Fortunately, SEO is also one of the least expensive marketing channels in terms of direct and recurring spend. Advertising stops sending referrals when you turn it off. But SEO involves enhancements, which should also be transparent to or beneficial to your shoppers, that improve the site’s ability to drive shoppers from natural search from that time forward. Consequently, while not free as many claim, SEO’s cost is rooted in the time it takes to plan and execute the improvements to your site. Seemingly every couple of months someone will claim that SEO is dead. That’s certainly true with individual tactics that seek to gain a faster advantage in search results — essentially sneaky tricks or cheating. For example, the very old practice of hiding white text on a page with a white background has long been stamped out. Likewise posting volumes of low-value “articles” or “press releases” filled with over-optimized links to your site in repositories for other sites to use as free content no longer has any SEO value. However, ethical SEO isn’t about tricks, short-term gains, and taking risks. Ethical SEO is what marketing has become: creating compelling content that shoppers value so much that they share and link to it. When combined with the technical and architectural components of designing and developing a site that is optimal for natural search, ethical SEO is an ever-changing discipline that will only die when consumers stop searching.